Excellent post Texas Honda! It looks like there is no reasonable source for Honda starter parts so other than cleaning it time for a rebuilt. Thank you for posting this TexasHonda (and thanks for the heads up on the post, PAhonda). I got my timing belt changed by my mechanic last month, and since then there has been a slight whirring noise and the engine has felt less responsive. I took it back in to him, he went in and didn't find anything. I am not a DIYer and I'm wondering if this is something my mechanic could have missed (he isn't a Honda or import specific guy, but he has always been good in the past). I'm also trying to figure out how serious it is and whether I should take it back to the guy or take the car to the dealership to have it looked at, or just live with it. How do I access the picture by GaryL that you referenced? Could your mechanic have missed this? Yes, particularly if he only removed the upper timing belt cover and observed belt tension manually. Belt tension may be OK. I think noise may arise from belt misalignment on the tensioner idler. I suspect pics are peeled out of all old posts to reduce storage size. PM your email address and I'll forward the pics. They are a bit too large to post in this forum. I have this noise on my starter now as well on my new accord. I've heard others do it, my last one never did. But this accord has a new starter in it and possibly its defective. It doesn't always do it, seems like you have to let off the key very quickly and then it won't do it. Fix is to remove the starter and lubricate the shaft the pinion gear slides on to engage the flywheel ring gear. New member. Your post helped us tremendously. 94 Accord has 315K miles on it. Timing belt changed only once before. The one we took off looked like new but we're changing it to prevent changing the whole engine right? Well the stud you spoke of for the inner tensioner was broke off apparently on the first TB change. After careful analysis we decided to drill a hole where the stud was. Then cut 4 horizontal lines on a bolt to act as a tap. We worked the bolt in with some oil then put some lock tight on, and then hack sawed the head off leaving a new "stud". Worked great. 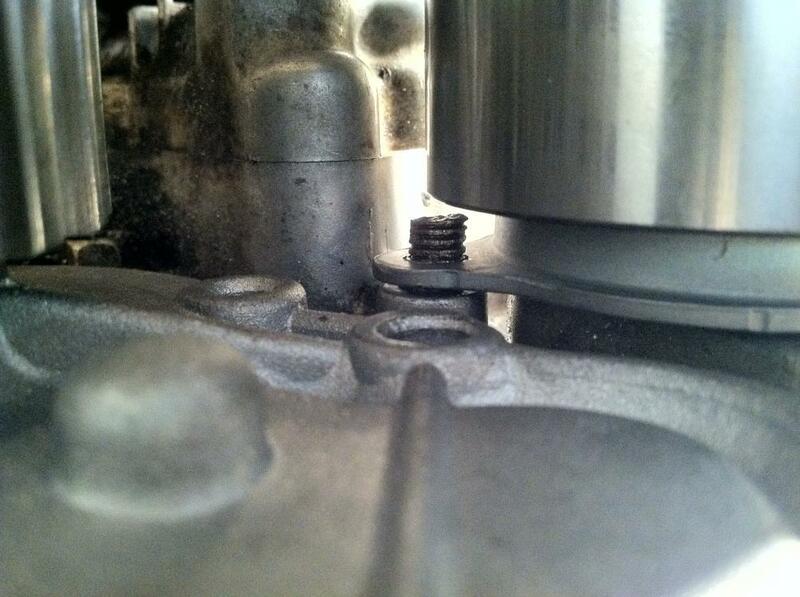 You need this stud so the spring can place the correct tension on the tensioner. Pros change in 3.6 hrs. Our learning curve took 3 days!